*Note: If you don’t have Google Analytics and Webmaster Tools connected, contact your web marketing vendor. It takes two minutes, and it’s worth it. In Google Analytics, go to Traffic Sources > Search Engine Optimization > Queries. This gem of a report shows you all the phrases for which you’re ranking and how high you rank. * By default, it’s ordered by “Impressions,” but we’re looking for rankings, so click “Average Position” to see the phrases ordered by rank. Page through this list until you get to the 10s, 11s, 12s and so on. Your website ranks at the top of page two for these phrases. *Note: the exact numbers are rarely accurate, but they don’t have to be. 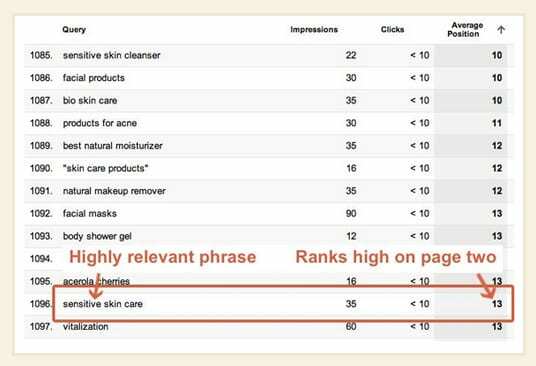 We’re not looking for the exact rank, we’re just looking for phrases for which we rank on page two. 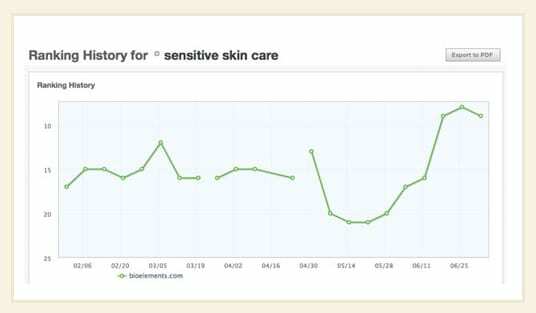 Here’s what it looked like for a skin care company, Bioelements, for the last week in March. Look at phrase number 1096. The second column is the number of impressions: 35. 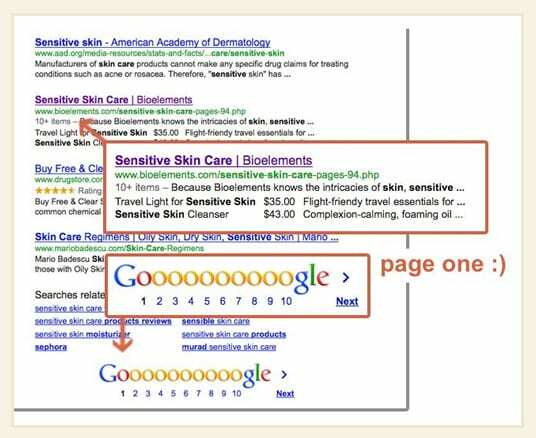 An impression is any time a visitor is on a search results page where the Bioelements listing is displayed. Presumably, it’s every time the listing is seen. Yes, Google Analytics is showing us this data, even if no one clicked on the link and visited this website. Thank you, Google! The third column is the number of actual clicks on the listing: fewer than 10. And the fourth column is the average position of this listing for this phrase: 13. There’s the Bioelements site, at the top of page two. It’s a product category page. Look at the link. It starts with “Products for…” Remember that the link is typically the same as the title tag of the page it’s linking to. 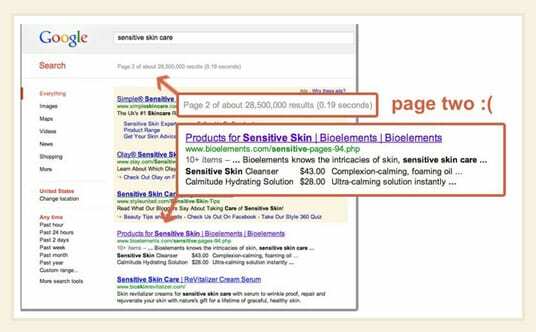 So we see that the title tag of this page doesn’t begin with the phrase for which it’s ranking (“sensitive skin care”). If this page was optimized for this phrase, the title would begin with the target keyphrase, but it doesn’t. Add the keyphrase to the beginning of the title: <title>. Add the keyphrase once in the header: <H1>. Make sure it appears in the body text at least twice. Find other pages that may link to this page and add links with the keyphrase in the link. Notice how the title tag is reflected in the link. The keyphrase is now more prominent (closer to the front). Often, making this one simple change can positively affect your rank. *Note: this is a very competitive phrase with big players and famous brands competing. The rank for this page jumped around quite a bit for several months before appearing on page one. To keep it there, more concerted link building, on-page tweaks and social promotion may be necessary. 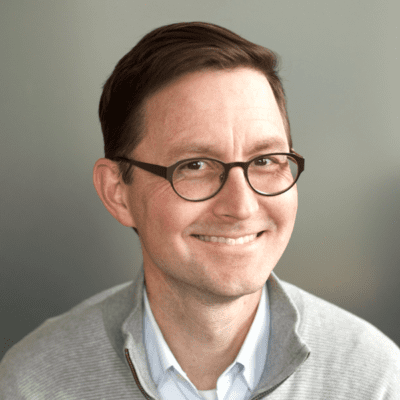 There’s an opportunity hiding in Google Analytics. 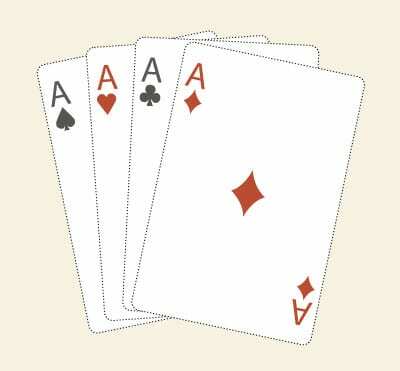 Take a look and see what cards you draw. Make a trip back to the traffic casino every few months. If you find a page that ranks accidentally at the top of page two without an optimized title tag, you just drew an ace. Thanks for sharing, what a swell find! I just did this for one of our clients yesterday! They loved it. Great tips Andy! Thank you for this post. My webmaster tools was not connected. The company that set the Google analytics up for my blog made me an administrator at my request today but they said I would have to set up a new act as they do not host us anymore. “I’ve made you an administrator – but you need to get it setup under a different tracking id/account. Google doesn’t have any way to transfer it to a different account. ” So does that mean if I do this, I have lost all my old analytics? Or would there be an old and new version for me to see? If I do lose them, is the change worth it? Thank you for your insight. Good post! What tool is the ranking history chart from (last one)? @LauraDanaLewis It’s from SEOmoz. I’m a pro member, which is a bit expensive ($100/month) but worth it…. Really a worth reading and as manamica said a great way to go for the low hanging fruit !! Great blog!! After listening your speech twice, one in your office (Professor Sanford Bredine) and one in IIT (Professor JD GERSHBEIN’s class). I am so excited that this website is became my second graduate school classroom. Even now, I always hope I could have the chance to hear your speech more. So many useful tips. I am using those tips in my own website and jobs. I just want to say Thank you for your blogs. Thank you for the encouraging words, Peng! I’m glad you’re getting value from this.